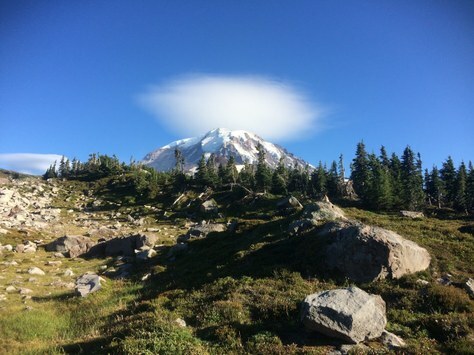 An opportunity to hike the Wonderland Trail comes once in a blue moon. This is the story of my recent spontaneous Wonderland adventure! When I was just 15, I hiked half of the Wonderland from Mowich Lake to Ohanapecosh (clockwise) with a handful of high school friends. At the time, going on this trip was a really big deal. We were young and relatively inexperienced. Preparing to hike the trail took a significant amount of work, and included purchasing a brand new pair of full leather boots. The trail left me feeling enchanted by the diverse and incredible beauty of the park, grateful for the wonderful bond my friends and I had formed, and wishing I didn’t have to stop! Hiking the trail with Tia was an opportunity I couldn’t let pass by. Though I would have to miss the first one and a half days, there was still plenty of trail left to cover. I would also be wearing the same boots I had worn on my trip ten years earlier! 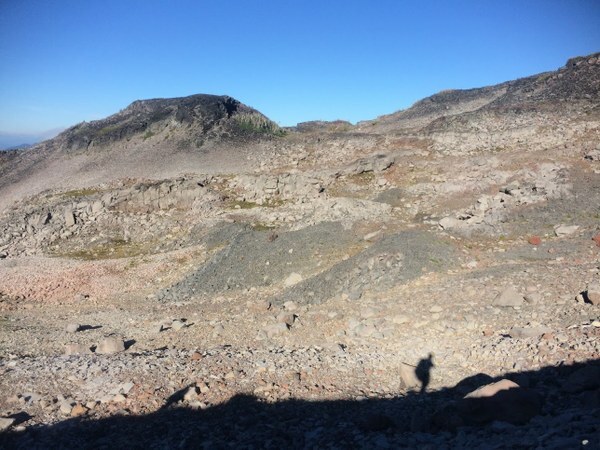 I was so excited to be hiking most of the Wonderland Trail, but that excitement was not without hesitations… What if I’m not in good enough shape? What if Tia wants to hike much faster than me (you would ask yourself the same thing if you saw her quads!)? What if I can’t find Tia when I go to meet her on the trail? Because I was leaving for the hike in just over 24 hours, I had to curb my fears and remind myself this was what adventure is all about: diving into the unknown and believing in my ability to adapt! The trip started out in a flurry. On Friday I had to finish packing my things, move to my new home, make a stop at the dump, go grocery shopping, pack for my trip, drive to the park, and hike four miles to Summerland. I can hardly fit all that in the same sentence, let alone the same day! After a long day of packing and moving, I finally left Seattle at 4:30pm and was on the trail by 7pm. Between moving, another backpacking trip, preparing music for a gig, and managing everything else in life, I had been holding my breath for weeks. As the light rapidly faded, I made my way up the gently graded trail and breathed deeply. I met Tia, and all of my anxiety faded away. The next morning, Tia and I woke up at 4:45am. We were hiking 18 miles, 4000ft of gain, and 4000ft of loss from Summerland to Mystic Lake, which we predicted would take us at least ten hours. This is not a mileage that she or I often cover in a day with heavy packs, and we knew it would be a challenge. After a less-than-efficient morning, we hit the trail at about 6:50am. The first half of the day was amazing! Beautiful scenery, great conversation, my body felt good, and I was full of energy. After lunch, we left the crowds at Sunrise and trekked over Skyscrape Pass. From there it was down, down, and down some more. At first, I could fly down the switchbacks. Tia was moving a bit slower, the downhill being painful for her after the previous two days of hiking. Within a couple miles, the pain caught up to me too - my knees were sore and I could feel several hot spots on my feet. I'd been wearing these boots for ten years without any problems - and now they were failing me! The last four miles were a slog. Over the course of traveling thousands of feet downhill, and a last final push for a thousand feet back up, I had developed a blister the size of two quarters on the bottom of my left foot. Tia had re-blistered the tips of both of her pinkie toes – perfect little thimble-shaped blisters. We made our final steps to camp and collapsed. 18 miles without a pack? Doable. With a pack? Suffer-fest! As we settled in for bed, I considered my sore body and giant blister… and those little doubts started to creep back. After reminding myself that each of the next four days were shorter, I laughed at the relatively little discomfort I was in, and reflected that many people have done much more challenging things in much less comfortable states. I was back in the mental saddle and committed to finishing the trip. The next several days revealed a diverse array of incredible vistas, ecosystems, plants, animals, and mountain views. 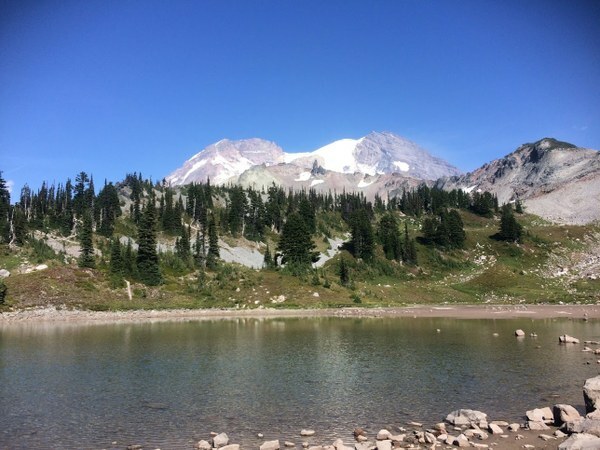 The day after we left Mystic Lake, we were graced by expansive alpine meadows, plunged deep into the lush rainforest river valleys, and trekked continually higher towards desolate high alpine passes. Crossing the suspension bridge over Carbon River, cool damp side of the mountain greeted us with rolling carpets of moss and bountiful fungi. Meandering through Spray Park brought us cascading streams tickled by pink Monkey flowers, California Corn Lilies, and Western Pasqueflowers, to name just a few of the plentiful wildflowers. At the highest point of Spray Park we witnessed the tiniest of lupines, just the right size to be a field mouse’s centerpiece. Every piece of trail brought something miraculous to observe and celebrate. After staying at Eagle’s Roost on our third night, we decided to hoof it through the 12 miles to Golden Lakes to allow some down time at the lake before dinner and bed. After an early start, we pushed through the miles and arrived at Golden Lakes by about 3pm. We did our laundry in the lake, took a quick dip, and Tia spent almost an hour sitting in front of a huckleberry bush picking and eating while we tried to remember how to do long division (how many years has it been since 4th grade?). In these hours, I was reminded of the aspects of backpacking I love so much: doing simple, enjoyable tasks in a beautiful setting, and having time to just sit and enjoy nature and not do anything if I so please. There are so few times in my busy life that I allow myself to do almost nothing, but re-learning the value and regenerative power of doing nothing was a huge takeaway for me. As we prepared dinner that evening, we watched the sun set over the western horizon of the park. The border of the park was clearly visible due to the stark clear-cut forest that butted up next to the boundary. In that moment I was so grateful that such a paradise existed, and that I had the opportunity to experience it. Everything that lies within the park boundary is truly a miracle… a miracle of millions of years of nature, and of the multitudes of conservationist women and men who made this place a sanctuary. As we made our way to our last camp at South Puyallup the following day, we took a long midday break at St. Andrews Lake. We laid in the sun, read our books, admired the birds, and soaked up the mountain views. During dinner that night, we reflected on our trip. We both were grateful to have had the opportunity to spend so much time with the mountain that is so close and yet we were so unfamiliar. Additionally, I was appreciative that Tia and I had the chance to get know each other in a way we hadn’t before. Tia and I had shared many dinners and walks together, but hadn’t spent more than maybe five or six hours together at one time, and going on this trip together brought many opportunities to get to know each other on a deeper level. Our trip ended just as it started: with an early start and a deadline to meet. 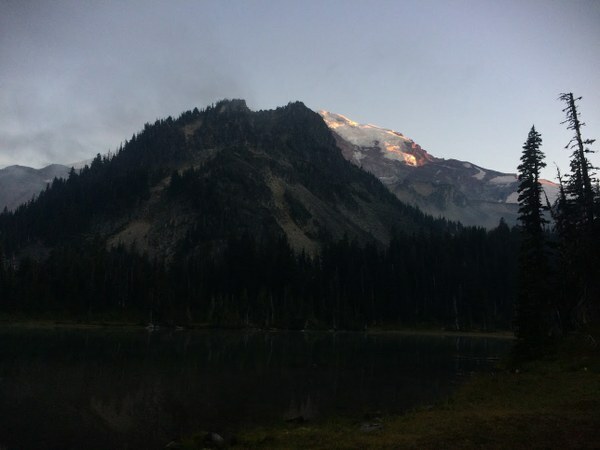 I had to be back at the Seattle Mountaineers Program Center to close the bookstore at 5pm, and we had 12 miles to hike and four hours of driving to do before then. Not to mention that something needed to be done about my odor, and the fact that I had only trail mix to eat until I got to work. We hit the trail pre-dawn at 5:40am, starting the gradual ascent up Emerald Ridge. When we reached the top of the ridge, the sky had filled with morning light. We were right at the toe of the Tahoma Glacier and could see all the way down into the Puyallup River valley. This was the closest we had been to the mountain since we started and was a grand way to bid farewell to our journey. We started down again from the high alpine meadows into the deep lush forests, making it to Longmire at 12:15pm. After a quick bathroom break, we were on the road and back to civilization. My trusty hiking boots had carried me to the end of the trail, and this would be their last journey. And yes, I made it to work on time.